CryptoSafeGuard is a BackupAssist tool that protects backups from ransomware attack and prevents ransomware-encrypted files from being backed up. CryptoSafeGuard is available for BackupAssist 10.1 (or newer) users with valid BackupCare. Ransomware is malware that encrypts files and demands payment to provide the decryption key so you can access those files again. Some ransomware can spread across connected machines and some can disable your system completely, so infected machines will often need to be recovered from a backup. It is therefore important that your backups are not infected, which is why CryptoSafeGuard is such an invaluable feature. To protect your systems against ransomware attacks, it’s critical that you have reliable backups so you can restore data or recover your entire system to ensure business continuity. However, when ransomware attacks your systems, it can also infect your backups, leaving them unusable. CryptoSafeGuard protects your backups from ransomware using two important features: the CryptoSafeGuard Detector and the CryptoSafeGuard Shield. When a backup job starts, BackupAssist scans the data being backed up. If there is any sign of a possible ransomware infection, all backup jobs will be blocked from running, and email and SMS alerts will be sent if configured. If your job backs up Hyper-V guests, the CryptoSafeGuard Detector will also scan the contents of those Hyper-V guests in one pass. This scan errs on the side of caution so it may flag files as possibly infected, when they are not infected. If this happens, you will be able to whitelist these files so that BackupAssist knows they are safe, and will not flag them again. Note: CryptoSafeGuard detects signs of a ransomware infection. It does not protect the actual system from ransomware, or remove ransomware. CryptoSafeGuard Shield prevents unauthorized processes from creating, deleting or updating data in your backups. This feature runs automatically in the background when CryptoSafeGuard is enabled. Note: CryptoSafeGuard Shield will prevent you from manually deleting backups. If you need to manually delete backups, disable CryptoSafeGuard, make the deletion, and then re-enable CryptoSafeGuard again. The first time you run a job with CryptoSafeGuard enabled, it will scan files modified in the last 3 months. This scan may take some time depending on the amount of data being backed up. Subsequent scans will be incremental and a lot faster, with minimal impact on the jobs’ run times. When you start using CryptoSafeGuard there will be a per-job grace period, and if a job detects possible ransomware, a warning will be displayed but the backup jobs will not be blocked. The grace period for a job lasts until the job has 3 consecutive clean scans. Grace period warnings will display a yellow banner in the BackupAssist UI. After the grace period, the banner will be red and indicate that all backup jobs have been blocked from running. Both banners can be clicked on to open the dialog that is used to confirm if there is an infection by selecting Yes or No. If you select No, the dialog will allow you to whitelist the suspicious files. The current whitelist can be opened from both the Backup home page and the Settings tab, and allows you to review and edit the existing whitelist. 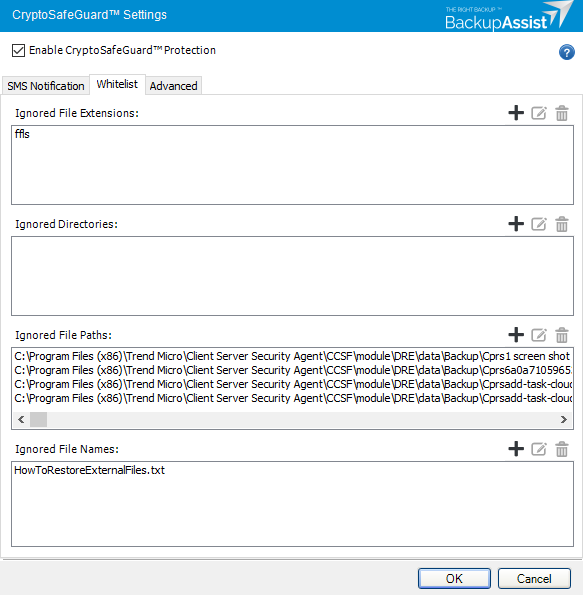 CryptoSafeGuard is available for all BackupAssist users who have BackupAssist 10.1 or later and an active BackupCare subscription. Not sure if your BackupCare has expired? Find out here. This link can also be used to renew an expired BackupCare. To upgrade to BackupAssist 10.1, click here and go to the Upgrade / Update tab. Note: If you’ve updated your BackupCare subscription, your installation of BackupAssist will need to be online so that the licensing server can tell your BackupAssist installation to make CryptoSafeGuard available. Once CryptoSafeGuard is available in BackupAssist, you should check that you have CryptoSafeGuard enabled. You can enable or disable CryptoSafeGuard using the Settings tab. Removing the tick from the box beside Enable CryptoSafeGuard protection will disable CryptoSafeGuard. Ticking this box will enable CryptoSafeGuard. Remember, this setting applies to all backup jobs. If CryptoSafeGuard is disabled, all jobs will be automatically unblocked, if they are currently blocked due to a potential ransomware infection. Note: When your backup destination is a NAS or network share, it should be secured using best practice data security. This means only machines running BackupAssist and CryptoSafeGuard should have access to the folders that the backups are in, and those folders should only allow access to the Backup User Identity. CryptoSafeGuard has a grace period, within which a job's failed scan will display a warning banner, instead of blocking all jobs. This grace period provides time to review any failed scans and whitelist any false positives. After 3 consecutive safe scans, the grace period for that job will end and any failed scans will result in a red warning banner and all jobs will be blocked. If there are 1 or 2 safe scans and then 1 failed scan during the grace period, an additional 3 consecutive safe scans will be required before the grace period for that job ends. If a job is within its grace period, any ransomware detections during the running of that job will not result in jobs being blocked. If a job is out of its grace period and it detects ransomware, all jobs will be blocked. If the yellow banner is current displayed, and a job that is out of its grace period runs, the yellow banner will be converted to a red banner and jobs will be blocked. If a job’s selections change, the grace period for that job is reinstated, but other jobs which are out of their grace period will remain out of their grace period (and will block jobs if they detect ransomware). Since the yellow banner does not block jobs, any jobs that run during this state are not sent an SMS, unless a job outside of its grace period detects ransomware, causing the yellow banner to be upgraded to a red banner (and an SMS to be sent). The Backup tabs Home page has an option called Run CryptoSafeGuard Scan. This option allows you to scan a system on demand for potential ransomware, and to whitelist files that cause a false positive response. When you select this button, it will open the Manual Scan dialog and allow you to select the files and folders to scan. Selecting the Scan button will start the scan. When a backup job runs for the first time with CryptoSafeGuard enabled, you may get false-positive detections. During the grace period you will only get warnings for flagged files. After 3 clean scans in a row the grace period will end, and any false positives or live detections will result in all backup jobs being blocked. If the backup selections are changed, the grace period will restart. If you have a lot of data or multiple jobs, it may be easier to run a single manual scan to check the entire system and whitelist any false positives before your back jobs run. When a backup job’s CryptoSafeGuard scan believes there may be ransomware, an alert will show next to the job in the Monitor UI and a red banner will appear at the top of BackupAssist’s UI. If you have configured email and SMS notifications, an email and SMS alert will also be sent. BackupAssist’s alert banner is clickable and has a help link to the CryptoSafeGuard documentation. You must click BackupAssist’s alert banner and follow the dialogs to respond to a possible ransomware infection. If you have set up the Email server settings and Email address list, and enabled Notifications in the backup job, a backup report will be sent with a BA8000, BA8001 or BA8002 error message to inform you of the detection. Enter the phone number in the SMS Number field using the standard international phone number format “+<country code><mobile phone number>”. Enter a text identifier or description for this machine so you can easily identify what BackupAssist installation the alert came from. The SMS test button will become active once a phone number has been entered in the correct format. Click Test and a test message will be sent to that phone. Note: When ransomware detection updates are added to CryptoSafeGuard, a pop up message will advise you that detection changes may cause new alerts and that, if required, additional files may need to be whitelisted. When a possible ransomware infection is detected, all backup jobs will be blocked from running until the CryptoSafeGuard alert has been resolved. If you are not aware of a ransomware infection, BackupAssist will allow your IT systems administrator to review the suspected files. Safe files can be whitelisted. Your IT systems administrator's review of suspected files should include trying to open the listed files in their relevant applications to see if they still work. If the administrator determines that your system has a genuine ransomware infection, you may need to perform a bare-metal recovery from your last successful backup. Click on the CryptoSafeGuard banner. This will open the CryptoSafeGuard user interface (UI). The banner will be yellow if the alert is during the CryptoSafeGuard Grace Period. Decide if there is a ransomware infection. To help determine if there is an infection, the UI shows all the files that CryptoSafeGuard detected as potentially infected, so they can be reviewed. Right clicking a folder will allow you to open that folder in Windows. Right clicking a file allows you to open the folder that the file is in. Your IT systems administrator will determine if you have a ransomware infection or not, and respond accordingly by selecting the Yes (have an infection) or No (no infection) button. Deciding if your system is infected by ransomware will involve checks outside the scope of BackupAssist and involve using anti-malware software and attempting to open important documents and images. A ransomware infection will often display a message on screen. It is worth noting that the first time you run CryptoSafeGuard, it is possible that safe files will be flagged and need to be whitelisted. Also, in most cases, the first indication of a ransomware infection is a persistent ransomware message on your screen. If you select Yes, a dialog will open and advise that all backup jobs have been blocked and will not run until the infection has been resolved. This resolution may involve performing a full system recovery using RecoverAssist. In this case, BackupAssist will be recovered with your system to an earlier functioning state. If you resolve the ransomware infection without a recovery, the alert banner will still appear in BackupAssist. Answer No (I’m not infected). If there is no infection, select No. A dialog will advise that you need to remove or whitelist the detected files. To help you do this, new buttons will appear in the CryptoSafeGuard UI. You can select Whitelist all files to whitelist and clear all of the files shown. You should not do this unless you have reviewed the files and know they are safe. A confirmation dialog will appear, then another to advise that the backup jobs will be unblocked. 1. Right-click the file and select that file or all files of that type. 2. Select the Whitelist selected files button. When all files have been cleared from the CryptoSafeGuard UI, a dialog will confirm that your backup jobs will be unblocked. The backup job that was stopped by CryptoSafeGuard will not automatically rerun. You can manually run the job or allow it to run at its next scheduled run-time. Whitelisting all the listed files will automatically unblock all backup jobs. However, if you have taken manual steps to resolve the infection (such as deleting files or restoring files from a backup), you will need to click Unblock jobs to manually unblock all jobs. Warning: Do not click Unblock jobs unless you have either whitelisted, deleted or restored each listed file. If you use Unblock jobs without taking these actions, the jobs may be blocked again next time the job runs. You cannot delete files using the CryptoSafeGuard UI, but you can access the files by right clicking their folder and selecting Open folder. This will open the folder in Windows explorer. Note: When deleting whitelisted files, hold down shift so the files do not go to the recycle bin, or empty the recycle bin after deleting the files. Whitelisted files in the recycle bin may still trigger a CryptoSafeGuard warning. CryptoSafeGuard may generate a possible ransomware alert and display the banner without detecting an infection in the files you are backing up. This could happen if CryptoSafeGuard detects certain patterns of behavior consistent with a ransomware infection. If this happens, clicking the alert banner will open the following dialog. There are no files to whitelist or delete so you must check your system for signs of an infection. Check if the desktop background has changed as ransomware will often remove the desktop wallpaper. Check all open windows and the desktop for any ransomware notification dialogs. Check a sample of the image files (png, jpg etc) and documents (doc, docx, xls etc) on your local drives to check they can still be opened. Select Yes or No, based on whether you found a ransomware infection or not. Selecting No will unblock your jobs without the need to remove or whitelist files. Selecting Yes will block all jobs, so the backup are not infected by the ransomware found on your system. To learn more about responding to a CryptoSafeGuard Alert, see your Blog article. If you respond to a CryptoSafeGuard alert by whitelisting files, you can review and change your whitelist using the Manage Whitelist section of the CryptoSafeGuard Settings dialog. You can also use this dialog to add to your whitelist without an alert, but it is recommended that you use the alert list to inform your whitelisting decisions. The Manage Whitelist sections allow you to add, modify and delete whitelisted files, directories, and file extensions. Any files whitelisted in the CryptoSafeGuard alert dialog will automatically appear here. This field is used to manage whitelisted files. Use the Add button to browse to the file and add it, and the Remove button to remove the selected file from the list. Selecting Edit will allow you to manually edit the entry, or browse from the entries location. Select Save after making manual changes. This field is used to manage whitelisted directories, which excludes all files inside the directory from the CryptoSafeGuard scan. Use the Add button to browse to the directory and add it, and the Remove button to remove the selected directory from the list. Selecting Edit will allow you to manually edit the entry, or browse from the entries location. Select Save after making manual changes. This field is used to manage whitelisted file extensions, which excludes all files with that extension from the CryptoSafeGuard scan. Enter the file extension. Do NOT include periods or wildcard symbols. E.g. enter txt. Not .txt or *.txt. Repeat this process for each file extension. Do not enter multiple extensions as a single entry. Use the Remove button to remove the selected file extension from the list and the Edit option to edit an existing entry. Select Save after making manual changes. Note: Adding files and folders to the whitelist means they are excluded from CryptoSafeGuard’s scan when a backup job starts. It is important to only whitelist files that create, or are expected to create, false positive responses when the scan runs. 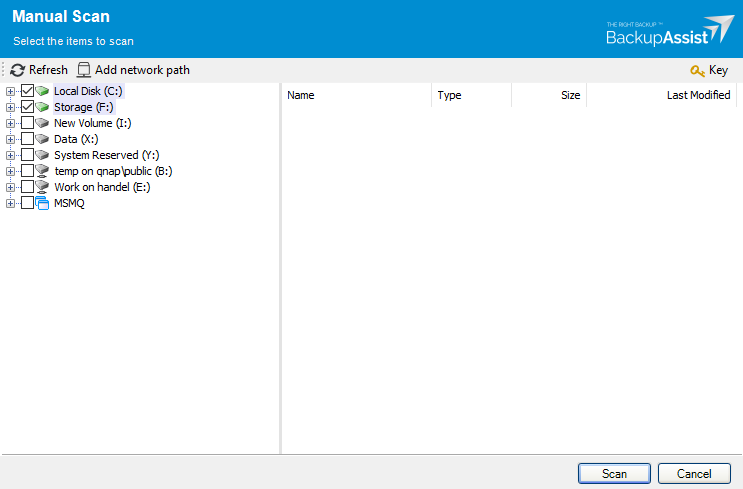 CryptoSafeGuard scans Hyper-V guests on Windows Server 2012 and later hosts that use locally supported file systems and basic partitioned volumes. SQL Protection jobs do not currently run with CryptoSafeGuard detection. When BackupAssist is installed on a Hyper-V host to back up the guests (VMs), CryptoSafeGuard will scan the guests’ contents before backing them up. However, only basic partitioned volumes are scanned. Dynamic partitioned volumes (e.g. striping, spanning) are not scanned. On Windows Server 2008 and Windows Server 2008 R2 systems, Hyper-V guests are not scanned during CryptoSafeGuard detection (since BackupAssist 10.1.3). Guest scanning relies on timely creation and cleanup of Hyper-V checkpoints and their corresponding avhd files, and this cannot be guaranteed on these older operating systems. Only locally supported file systems are supported when scanning guests. This means that Linux file systems like ext3 are not scanned inside guests unless there is a driver supporting that file system on the host. SQL Protection jobs do not currently run with CryptoSafeGuard detection. Support requests are not logged from this dialog. If you require technical assistance, please contact support.